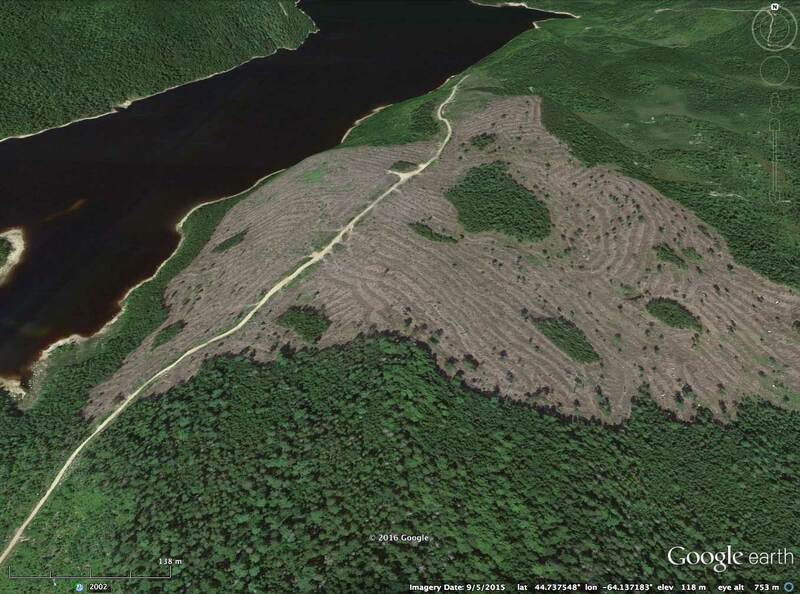 Has clearcutting on Crown land in Nova Scotia increased or decreased? The answer may depend on what and who you ask. There was no descriptive text to accompany the numbers. I guess they are intended to show that about 1/3rd of Crown land is not clearcut, and that for the Province as a whole the percentage non-clearcut, while less than for Crown lands, has increased. NSDNR, apparently, wants to reassure Nova Scotians that the concerns expressed in numerous letters, editorials, blogs etc about increased clearcutting in Nova Scotia, especially on Crown lands, are not backed up by the facts. So, OK, the percentage of Non-Clearcut land has been between 1/4 and 1/3rd of all cuts on Crown Land and, while less, has been showing some increase for the province as a whole. The Minister of Natural Resources also wrote that the “amount (hectares) of clearcut harvesting has decreased 23 percent since 2010,” referring to “Data collected by the department from Registered Wood Buyers and private forest industry in the province”. 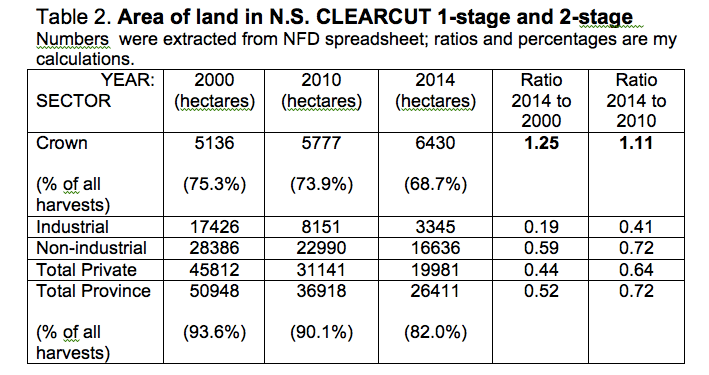 The NFD numbers in Table 2 above indicate that the total area clearcut (1-stage and 2-stage) for the province as a whole in 2014 was 72% of that in 2010, i.e. a reduction of 28%. This is a larger figure than that given by Hines for 2010 to 2015 or 2016 (23%) but they are in the same ball park, and either way it’s a substantial reduction. 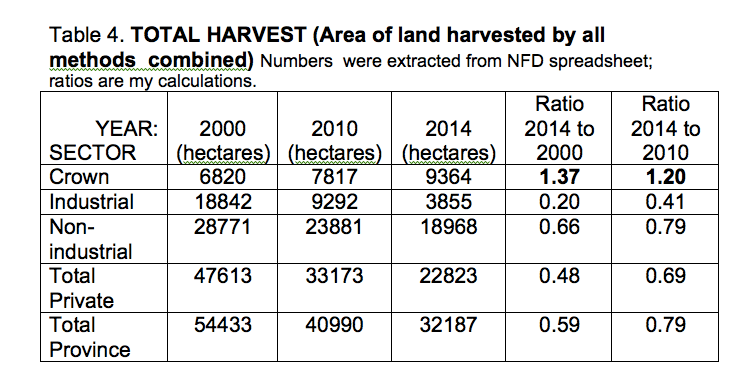 For the province as a whole, the total harvest in 2014 was 79% of that in 2010, i.e. a reduction of 21%. The reduction in clearcutting cited above was 28%, so most (~3/4) of the reduction was due to lower harvests overall; a quarter of it might be attributed to changing practices. The declines in forest harvests overall underscore the continuing decline in the total dollar value of the forest economy in Nova Scotia. The decline from peak years in the late 1990’s/2000 to 2010 is well documented in the 2011 Woodbridge Report for both sawmills and pulp and paper; a Woodbridge 2015 report indicates some recovery in the period 2010-2014 which is not reflected in the numbers above. What stands out in these numbers, however, is the substantive increase in the area of Crown land harvested (clearcut and total) over both intervals (2000-2010 and 2010-2014). This increase is in marked contrast to large declines for industrial and non-industrial private lands. 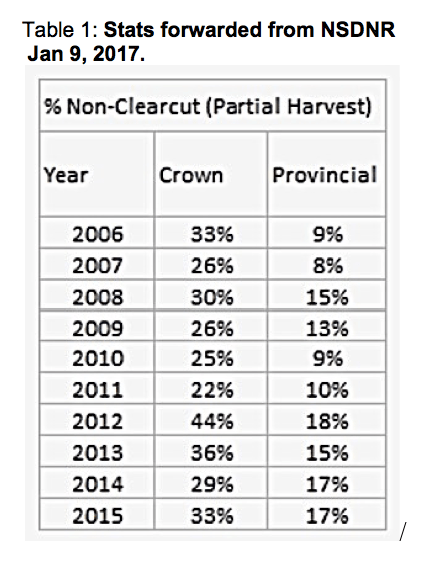 When Minister Hines stated that “the amount (hectares) of clearcut harvesting has decreased 23 percent since 2010”, he was referring to the province as a whole, and avoided to mention the increase on Crown lands. Simply stated, the numbers that Minister Hines/NSDNR presented to refute concerns about clearcutting do not tell the whole story, especially in regard to Crown lands. The more complete numbers available on the National Forest Database appear to confirm public perceptions that Crown land harvesting has increased. Even those (NFD) numbers still leave a lot of questions unanswered, e.g. Why has NSDNR increased cutting on Crown lands so much when overall demand for wood products has declined? Why has the use of Industrial Lands declined so much? Is there a connection…? See: 2015 stats for Nova Scotia on National Forestry Database illustrate continuing pressure on Crown lands (Post, Apr 4, 2017) for some further comments on this question. This blog post is the 1st of three in a series that explore the apparent contradiction between public concern about clearcutting in Nova Scotia and NSDNR reassurances that clearcutting has been reduced and that “all harvest treatments are aligned with the nature-based requirements of Nova Scotia’s lands”. What’s a clearcut and what’s not a clearcut in Nova Scotia? How much forestry in Nova Scotia maintains mixed, multi-aged Acadian forest? This entry was posted in clearcuts, Economics, NSDNR, Show Us the Science. Bookmark the permalink.